Automotive Testing Expo Korea will mirror the same proven successful formula of its sister exhibitions in Stuttgart, Detroit, Shanghai and Chennai, and bring together the world's leading manufacturers of test and evaluation equipment and test service providers. 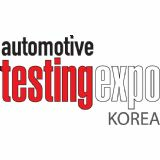 Automotive Testing Expo Korea will represent the most targeted gathering of automotive test and evaluation executives anywhere in Korea. This is the forum that will ensure you are up to speed with the very latest products and procedures available to the industry.